Even if you are a seasoned exhibitor, there is always a lot to organise when you are preparing for an event. Every venue is different and every country is different too. We have global experience and that’s why clients know that they can rely on us. 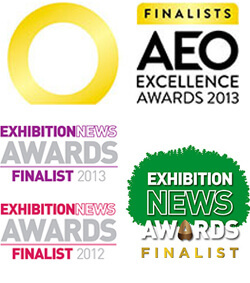 We work as a team to make their exhibitions a success. Whether you need us to design a single custom stand or to be your official stand contractor, we can handle the job. When you work with a team that has a long track record of working with brands all over the world, you can relax. Between our team and our trusted partners, we have worked at many international exhibitions and trade fairs already. Our local contacts help us to build you a custom stand that is sure to impress. We can even plan the reception party for your guests! Take a look at our team in action and you will see that we deliver the results you need, wherever you need them. You can read some of the testimonials we have received from happy clients. Whether it is your first or your hundredth international fair, let us know what you want and we are here to help. During our experience over many years we have built up a large network of trusted international exhibitions partners and employ a rock solid project management team to deliver high quality projects every time. To find out more about the custom and modular services we offer, select one of the solutions below. You might also like to find out more about the glass exhibition system we can offer you.